Pemanca Tan (sixth left) hands over a framed combo image featuring old and new photos of the school to Manyin (fourth right) as Abdul Wahab (third right) and others look on. SARATOK: It now appears to be a mistake to leave it to the federal government in the past many years to assume the provision of education facilities in Sarawak. Chief Minister Datuk Patinggi Abang Johari Tun Openg said this was because more than 1,000 schools in Sarawak are now in dilapidated condition because the federal government did not provide sufficient funds for repairs and restoration of the schools. “Education is key to Sarawak’s development. Although education is a federal matter, the Sarawak government is putting a lot of emphasis on education development to ensure that we can provide the best environment for our students to excel in their studies. 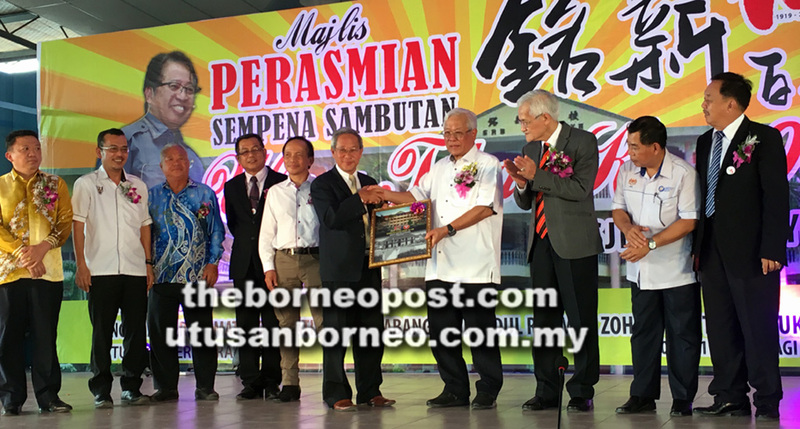 “For the past many years, we left it to the federal government to see to the provision of education facilities in Sarawak and this was a mistake that resulted in over 1,000 schools in a state of disrepair,” he said at the 100th anniversary of SJK© Min Syn here yesterday. The text of his speech was read by Minister of Education, Science and Technological Research Dato Sri Michael Manyin who represented him at the event. To rectify this problem, he said the Sarawak government offered RM1 billion loan to the federal government to do repair works on all dilapidated schools in Sarawak. He said that Education Minister Dr Maszlee Malik had agreed for the federal government to accept the loan, which would be repaid through contra from the existing loan owed by the Sarawak government to the federal government. “This means that RM1 billion will be deducted from the RM2.38 billion which Sarawak owes the federal government. “Sarawak made a loan with the federal government based on needs stated in the Federal Constitution including for the purpose of developing affordable housing for the people,” said Abang Johari. He also said that the Ministry of Education, Science and Technological Research was established following a cabinet reshuffle in 2017 to ensure Sarawak’s aspirations in education sector are given sufficient attention and emphasis. According to him, English is now Sarawak’s second official language not because it is a global lingua franca but because it is a language for the spread of knowledge. “Sarawak now has foreign universities with local campuses such as Swinburne University in Kuching, Curtin University in Miri and University College of Technology in Sibu. “The Sarawak government will also establish five international schools in several places as investment to develop the education sector based on Singapore’s successful model,” he said. On another matter, the chief minister congratulated the board of management of SJK© Min Syn on the school’s 100th anniversary. He said the setting up of the school was proof of the Chinese community’s priority on education as a platform for success as it was set up by the Chinese settlers when they settled in Saratok some 100 years ago. Meanwhile, Manyin in his personal remarks said Sarawak’s readiness to use its funds to repair dilapidated schools reflected the Gabungan Parti Sarawak (GPS)-led government’s commitment to provide better learning environment for the people. He also said the school would be receiving an allocation of RM300,000 from the Sarawak government, which had been approved by the chief minister. This was in response to a request from the school board of management chairman Pemanca Tan Yok Ngee for funds to upgrade facilities in the school due to the growing number of students. Kalaka assemblyman Datuk Abdul Wahab Aziz who spoke earlier, pledged RM30,000-grant to the school’s management committee, RM20,000 to the Parent-Teacher Association and RM30,000 to the preschool. He also announced RM88,000 from his rural transformation programme (RTP) funds for the school’s upgrading. “This school has contributed to the progress and development of Saratok, and also a symbol of unity among the people. The school is not only meant for the Chinese but also the Bumiputera communities who now make up 45 per cent of the school’s population,” he said. Permanent secretary to the Ministry of Education, Science and Technological Research Datu William Nyigor, a political secretary to chief minister Dr Simon Sinang Bada, Saratok District Officer Mohd Ikhmal Abdullah, district education officer Anis Madeli and community leaders were among those present at the function. The post RM1 billion to rectify mistake appeared first on Borneo Post Online.